When it comes to transportation planning, networks get a lot of credit. This is particularly true in grid cities like Toronto, which transportation scholar Paul Mees has written at length about as the poster-child for the power of transportation networks (Spacing Vancouver reviewed his most recent book Transport for Suburbia). Having been particularly inspired by Mees and others, I’m always on the lookout for unobserved transfer points, missing links and connections that expand my access to Toronto. Nowhere is this more fun to do than with the bikeway network. In an era better known for vanishing bike lanes, little coverage has been given to the expansive off-street cycling trails being built in Toronto’s inner suburbs. In 2011 alone, 25km of off-street trails were built (meanwhile on-street lanes experienced a 3.2km net loss). While that hasn’t made my daily ride to work near Union Station any easier, it did get me to take my bike on a GO train after work last week. For blazing new trails on smoothly paved and car-free paths, Toronto’s inner suburbs, not its downtown, is where it’s at. With a 2012 Bike Map as my guide, I set off from Old Cummer Station in North York with the idea to link several off-street ravine paths with the new CN Leaside trail built between York Mills and Eglinton (see my route here). 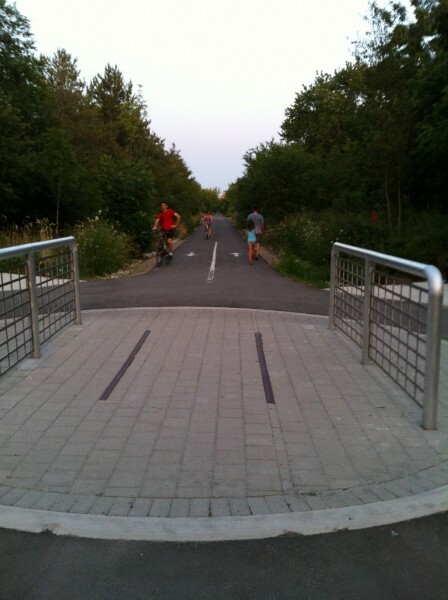 Running on an old freight corridor, the new trail mixes Davisville’s Beltline feel with little design touches drawn from New York’s High Line Park and the West Toronto Rail Path. Beautifully paved with new bicycle traffic signals (Toronto’s first?) and parts of the old track preserved at intersections where benches and artful bike parking rings sit, the CN Leaside trail is well worth checking out. Coming from the well-used Betty Sutherland trail to the north, I couldn’t find a single sign to direct me towards the CN trail’s obscure starting point at the bottom of an industrial park southeast of York Mills and Leslie. This was despite following a recommended route on the City’s bike map. Nor were there any signs along the trail pointing out the many nearby off-street paths — in Edwards Gardens and Wilket Creek — I could connect to. Worst of all, there was no mention that the path’s southern terminus was a dead end a full kilometer after the last chance to exit. Having lived in New York and recently visited Washington D.C., what is most striking about their bicycle infrastructure is the way-finding — a.k.a. the signage and route design — that ensures you get from A to B. With bike lanes just as challenging to build there as in Toronto, these cities have been peppering their streets with signs directing cyclists to major landmarks from miles away. As a result, no map is needed to find a safe route from Midtown Manhattan to Prospect Park, Brooklyn — an 18 kilometre trip — even if you’re new to the city. In these places, the few bike lanes that do exist become the trunk lines fed with riders through well-signed streets. This is not unlike how a limited number of subway lines are fed by a network of streetcar and bus routes, or how cars are funneled off local streets and onto arterials and highways. It’s the way-finding infrastructure, an easily implemented, cheap and uncontroversial tool, that makes these still limited bicycle networks function well. Toronto’s ravine and rail paths hold huge potential to be those trunk lines, but only if they are linked, visible and easy to use. Despite winding through all four corners of the city, these off-road, car-free trails remain literally below the radar of much of Torontonians despite their potential usefulness. This doesn’t mean they can act as a permanent surrogate for more direct on-street lanes. Yet with off-road trail expansion moving full-speed ahead, these new and existing paths need to be integrated with the larger system rather than being treated as piecemeal projects mostly for the benefit of a local community. After all, few cities can claim to have 286km of already built off-street trails. It’s time they were put to better use. It’s amusing how often those who doodle transit maps in their spare time put a GO Transit link onto this trail which has been a path for quite some time. Very nice little exposé. I too was incredibly frustrated by the dead end and lack of warning about it. After much hype about the opening of the spur line trail by my councillor, it was a shame to find out that it won’t get me anywhere. There are bicycle traffic signals along the hydro corridor path at Birchmount and Ranstone Gardens (between Eglinton and Lawrence). There were already traffic lights there, so I’m not entirely sure why they were needed, but perhaps there’s a subtle difference that I’m missing. A map, however inadequate, would have been helpful. You think those connections are bad, check out some of the routes that go through large parks (i.e Thompson Park in Scarborough). Directional signage and wayfinding does not exist at all. We don’t need to look far for proper connections and signage – Ajax does this quite well between various segments in their Waterfront Trail and through their ravines such as Duffins Creek. Also: Bike signals are already along the Finch Ave Hydro Corridor Trail as well. My commute takes me along CN Leaside, so that deadend stumped me a few times at first. It’s a fantastic path, but it really needs better connections at both ends. I do like that there is a plan for a better connection to the West Don trail at the north end. The current connection over the 6-lane York Mills bridge and through a business doesn’t feel as safe as it should. I’m planning to start writing again here. I’ve been using some of the trails, and like the Leaside Spur Trail, there’s others that have no wayfinding. Highland Creek (sort of like the Don Trail) has a similar problem, but at least it is through. This bike path dead ends at the southern end, and there is no exit to the neighboring streets. A connection needs to be built through one of the office parks here to connect the bike path with Leslie or Eglinton. Yes, trail signage is abysmal in Toronto and seems to have been designed by someone who sits behind a desk all day in that there are sometimes signs where it is really clear where to go without any but in other places it’s a toss up of several possible routes with no sign at all. As noted above, several of the Scarborough trails are very poorly marked and hard to navigate, even with a bike map. Then there are routes that make great links with no signage at all. (eg along The Esplanade from Yonge to Lower Sherbourne which nicely links up the Yonge bike path to the Lower Sherbourne one and the path going further east. This one is still not on bike map though was aspproved apparently when the Yonge trail was created a few years ago.) Trail maintenance is another big problem – again someone from the City should have to cycle on the trails and experience the poor surface, potholes and almost total lack of useful signage. Emails to the Cycling folk get pleasant replies but no action! You want a bad connection, try Meadowvale Road up around the Zoo when heading over to Beare Road, nelly is that thing crud. You literally j-walk across 5 lanes of traffic, with 2 merge lanes from other smaller roads leading into it. I’ve used a lot of the bike paths around the outskirts of TO, and its true, we really do need better signage, and better connections. As J up there noted, Ajax is really good example of well done signage. Toronto could take a tip from its 905 neighbours in that regard. Earlier in the spring there was a way to get off the trail to Leslie. Follow the the path on your right and through the gate in the fence. Across the parking lot to Leslie. That was before they locked up that gate. The traffic light across Leslie a little south of this driveway even has markings on the ground for bicycles. Were they encouraging riding on the sidewalk up to this point? 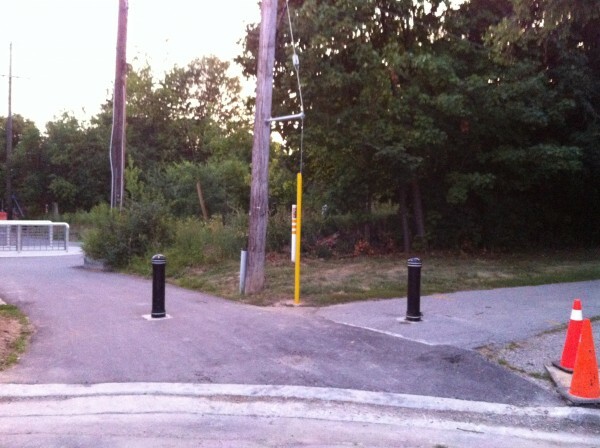 The sidewalk on the west side led up to the entrance to the parks in the ravine and the bike trails within. I wish I knew the name of the company next to Wrigley Canada. Hope they would open up the fence again. Our patchwork of bike routes is really far more of a “notwork” – and why? why? are we OK with putting many hundreds of thousands into the costly off-street lanes, and now, a few kms (maybe) of on-street separated lanes when we don’t have a basic grid in place? The off-street portion of the Bike Plan is at about 115% complete, and yet the on-road is about 24% and declining, and even then, this is a feeble effort, as it tends to send cyclists on a looping/sidestreet route. While our grid is not nearly as complete as Vancouver, Winnipeg, or Calgary, with real problems showing up in the west of Bathurst old core where only the big roads with streetcar tracks really clearly give good access, there’s one obvious fix of Bloor St., and it’s only a mere $25,000 a km to repaint a road for bike lanes. As Bloor inches forward for repaving next year, the City, and Councillors like Ms. Bailao, Perks and Layton, really need to have some pressure to ensure that bike safety is first and foremost on this project. As with transit, the core is being bled somewhat to pay for the costly projects and we don’t have park paths to use.